Ovenbirds are well camouflaged on the forest floor. Males and females look similar, and both have an orange stripe on top of the head. Mid-summer sounds now fill our ears, with insect choruses – by cicadas, grasshoppers, katydids, and crickets – being most obvious, but the ovenbird keeps on singing its song in deep, shady woods after many other birds have gone mostly quiet for the season. You’re more likely to hear than to see an ovenbird, although these birds are not shy. They are warblers, but their song is far from musical to our ears. Loudness is a key to recognizing the song. As the bird sings, its song gets louder and louder (over a span of about 4 seconds), so you might think the bird is coming closer. To us the song seems repetitive as the male ovenbird seems to yell “tea-CHER tea-CHER tea-CHER TEA-CHER” (with “tea-CHER” repeated 8-13 times). Yet ovenbirds can tell each other apart by their songs, and neighboring males sing back and forth in the woods to assert their ownership of territory. Ovenbirds sing during the spring breeding season, as most other birds do, but afterward they sing with renewed energy as fall approaches. Ovenbirds spend lots of time on the ground and in shrubs in deep forest, well away from forest edges. They are camouflaged by their appearance. They are grayish olive green overall, with a white eye ring and a white breast with dark spotting that may look like stripes. You might even say they look somewhat similar to wood thrushes, but ovenbirds have an orange stripe on top of their head, outlined by a black stripe on either side of it. They raise this orange crest slightly when they’re excited. For ovenbirds, dead leaves are a key part of the deep woods environment. These birds like a thick layer of leaf litter on the ground. It’s a source of food. Ovenbirds typically walk along, with a sort of gawky walk, searching the leaves for insects, beetles, grubs, caterpillars, and ants. They also nest among the dead leaves on the ground. The ovenbird’s odd name comes from its unusual nest, which has a dome. The nest is shaped like an old-fashioned outdoor oven. Set at the base of a shrub or fern or next to a fallen log, the nest is a cup nestled in the dead leaves and covered with a dome. The nest has a side entrance that can’t be seen from above. The whole thing – cup, dome, and entrance – is one piece, which the female weaves from dead leaves, plant stems, grass, and bark. It’s only about 6-9 inches wide and 4-5 inches high, so it’s not large and not easy for people to spot. When young ovenbirds are ready to leave the nest, they simply walk or hop out. Half of the young (from a typical brood of four) follow the female around and half follow the male as they learn to forage on the ground. When they need to make themselves invisible to danger, they stay perfectly still. After a few days to a week or so, they begin to fly and can go up into the shrubbery. Those that survive become independent of the parents at about one month of age. In spite of being well hidden, the ovenbird’s nest, like other ground nests, is vulnerable to predators, and so are the young. About 25-30 percent of nests are typically lost to predators, such as squirrels, snakes, skunks, raccoons, blue jays, cowbirds, chipmunks, and even mice. The losses are higher near forest edges, where there are more predators. Ovenbirds do best in large, undisturbed, unbroken forests. Not only do the tall, mature trees provide plenty of leaf litter, but they also shade the ground and prevent too much undergrowth. In Westborough, for example, you’re more like to hear an ovenbird in the deep woods of Libbey Conservation Area than in the recently thinned woods of Bowman Conservation Area surrounding Sandra Pond. Mass Audubon reports a declining trend in ovenbirds since 1980. 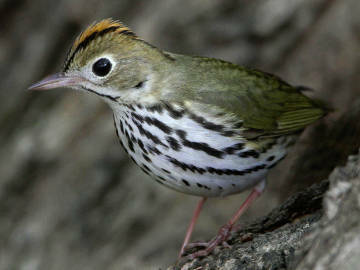 The ovenbirds in our area migrate to the Caribbean for the winter. Most leave in late September, but some may linger into October or even early November. They’ll reappear in late April or early May. Enjoy listening for them now, and again in the spring.